We have been waiting for years to see it and it now happened. It was great, better than I expected. Animation is good. Story is great. You go through all emotion, sadness, happiness. Good fight. A brother fight. All in here was good and well done. Can't wait for a third season! This anime is AWESOME! The story is very, very original and the whole series is jam-packed with action (as well as a little romance, very little though) This is defiantly one of my top 5 anime with it's amazing art/story/action You need to watch this! If your looking for an anime with great characters amazing story and catchy music, then look no further. Blue exorcist is one of those anime where you can binge watch non stop. like I said before, this show has some great music, my personal favourite being take off. This was originally a shonnen jump manga. I gotta say if you're a fan of shonnen manga with demons and loads of action, then I'd highly recommend you read it. The story follows the everyday life of Rin Okumera, a no good 15 year-old who always seems to have the worst of luck weather it's holding a decent job or doing well in school. He's always complaining about the life he's been stuck with. This is until he discovers he is the son of satan. And if that's not cool enough then I don't know what is. In this anime there are two dimensions Ashia our world and Gehenna a parellel universe where demons live. Rin and his twin brother,Yukio,enrol in true cross academy, a school to train exorcists. There he meets new friends as well as the bizar. otaku head master, Mephisto Phellis. After the death of The Okumera brother's foster farther, Rin swears to on day avenge him by killing Satan himself. This alone won't be easy so will need to train hard, making new enemies along the way. One downside to this anime is It didn't really feel like it ended right. I mean sure there's a movie but if you really want to finish this I highly suggest reading the manga. The reason the anime stopped was because the manga wasn't being published fast enough, so they had to make their own conclusion to the show. This is similar to what they did with fulmetal alchemist, so hopefully they might make another version of blue exorcist. The manga is still going on today and is really REALLY good! So if your scratching your head wondering what to watch or read next I highly recommend both the anime and manga. There are two things which really get me going in this sort of series: Good fight choreography, and good writing. This show most definitely has both. By fight choreography, I also mean how fight scenes are animated; more often than not, there is no flow to the fights, and repeated animations are used for the sake of making animating easier. I'm not saying that this should never be done - since there are moments in any anime when it would not make a noticeable difference - but there are times when it just makes an enthralling scene disappointing. In Blue Exorcist, there are no such moments. Each fight is unique, has a definite purpose behind the characters' actions, and at no point (that I can remember) is a gradient background used for the sake of reusing a movement. The series is also very well written, the characters especially so. I know it's going to be a good series when I fall in love with four of the character designs by the end of the first episode, and even more throughout the series; the characters are all unique without compromising on depth, and all interact with one another and react to situations very much in character. There's also a lot of wit in the series (both from the characters themselves and in how its written) making the character scenes just as entertaining as the action sequences. On top of this, the plot constantly progresses throughout; there are a couple episodes which don't really push the plot on, but they still develop the characters, and build upon what we know of the world. The fact that there is a definite change between almost every episode is quite refreshing, and the fact the characters react accordingly is almost surprising - so often I've seen a significant change in an anime without the characters apparently noticing any difference. The only real downside is how predictable the story is. Although it is set in a unique world, and the characters' situations are all interesting, it's pretty easy to guess how each episode's going to end when you're just a few minutes into it. However, it's the small details are what make it interesting; the minor plot points are often unexpected, and the writing itself certainly makes up for the show's predictability. Overall, it's a very worthwhile watch - I definitely enjoyed it. The animation and visual style are very nice (and certainly not lazy), the soundtrack is gorgeous - it's now one of my top three anime soundtracks - the characters are well thought out, unique and lovable, the script is fluid and clever, the world is very detailed while still being simple enough to instantly understand, and although the overarching plot is predictable, in all aspects of the show it's the small details and the little quirks that make it. Season 1 was awesome and now season 2 just compliments it so well! I couldn't wait for this to come out and it didn't disappoint Yukio is developing awesomely and I Just love every single character, one of my all time favourites by far. Can't wait for season 3 (Hopefully). As a fan of the manga I can say this anime is a good adaptation, but this arc isn't really as interesting as other arcs in the manga which is the only reason I didn't enjoy watching this season of the anime. Once you've read the arc, there really is no need to watch the adaptation because it brings nothing new to the table. This season of the anime may be a little confusing at first for people who have only seen the Blue Excorsist anime because there are some points from the first season of the anime that are completely ignored, since this new season is a lot more true to its source material. Overall, Blue Excorsist is a good adaptation, but that's it. I never really expected to like this anime. As from the look of it the anime doesn't look amazing at all. However after watching it I can say that I really really enjoyed this anime. From the animation to the characters to the story I liked it. The anime is about a boy named Rin Okumura who was never really good in school and never really could get a job. He was really inferior to his twin little brother Yukio. However after seeing some weird things he later found out from his dad who is revealed to be a exorcist of demons that Rin was the son of Satan. He later gets enrolled into a school for exorcist and from there on it starts. This anime was so good that it made me read the manga! Hopefully this anime gets a season 2 as from the ending I really believe it needs one. 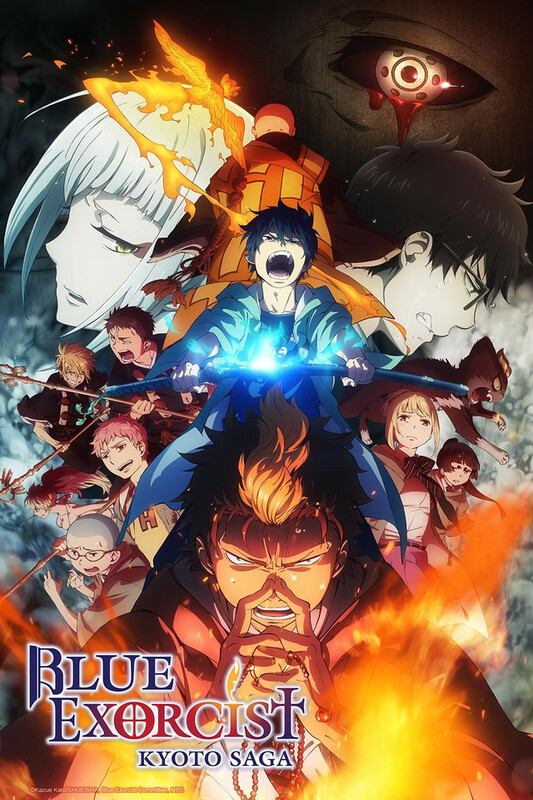 Blue Exorcist Why So Blue? Blue Exorcist is a very good and still developing manga series. The anime however ended. The anime also lacked the time to add more filler into the story because the manga was on a break. I recommend this as a starting anime for any age group above ten.